I've been on a handful of pub crawls - those mostly consisted of beer and shots. I've never been on a wine crawl before - this will be a first. Time to suit up! Unless you saw the Naked Man episode of HIMYM in which case perhaps it's time to suit down. Wine and hump day - good mix - can't wait to make it through half the week. 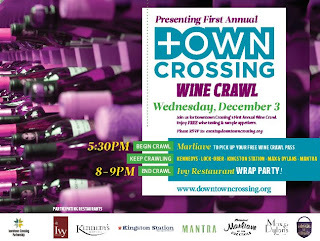 0 Response to "1st Annual DTown Crossing Wine Crawl - 12/3"